You will love this Italian cornmeal even more after grilling it and topping it with eggs and hollandaise sauce. When you love cornmeal, you also love polenta, the version that comes from Italy. It is usually cooked by mixing it with simmering water and stirring continuously until it thickens. Then, if you want an added grilled flavor, which I prefer the most, it takes more effort to pour it into a baking pan to set and harden, slice, then grill. 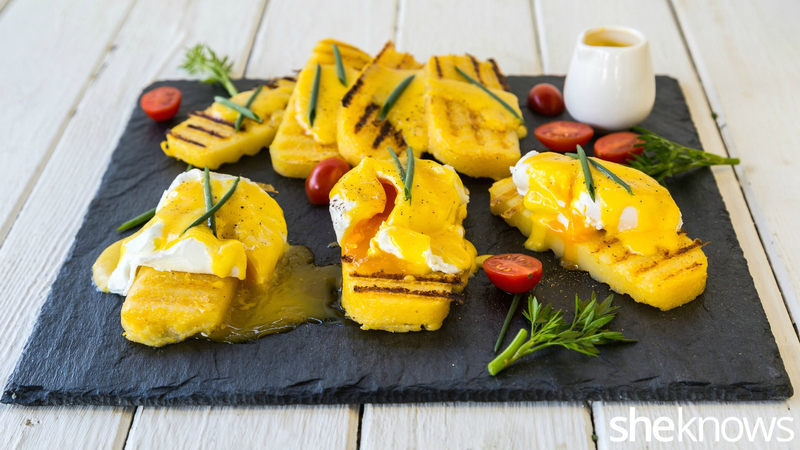 But nowadays, to save time, we can buy precooked polenta set into bricks that are ready for baking or grilling. And with this recipe, we are using that shortcut to create this delicious (and I really mean wow) breakfast. 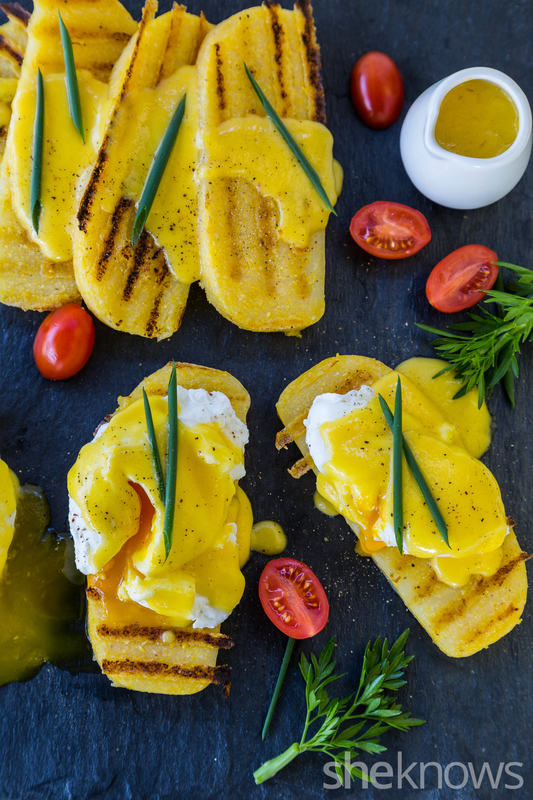 Forget the English muffins, because under this eggs Benedict we are using grilled polenta instead. If you want rich flavors, then this is a must-try. In fact, I can easily say this is one of the best breakfasts I have ever had. 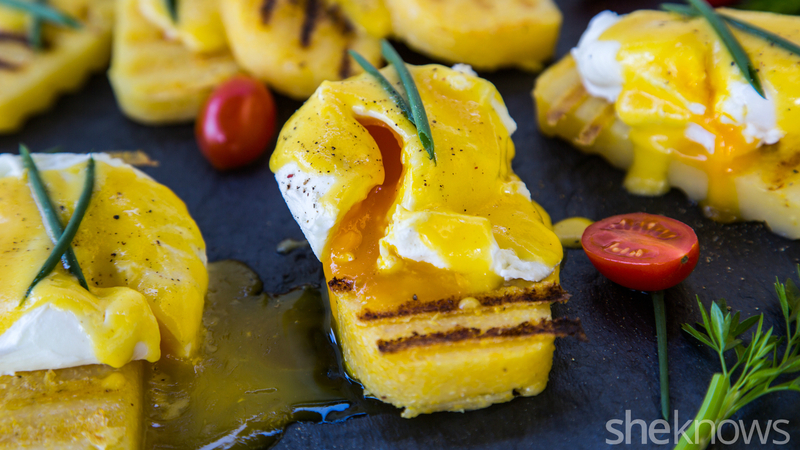 Serve eggs Benedict on grilled polenta instead of English muffins if you want an equally delicious change to a classic. Make the hollandaise sauce. In a heat-resistant bowl, whisk together the lemon juice, 1 teaspoon of vinegar and the egg yolk until frothy and thick. Place the bowl over a saucepan with hot, simmering water, making sure the bottom of the bowl doesn’t touch the water. Gradually add the butter while continuing to whisk. Make sure the mixture doesn’t become too hot so the egg doesn’t scramble. If this starts to happen, remove the saucepan from the heat. When the sauce has thickened, season with salt. Remove it from the heat, and cover until ready to be used. If the sauce becomes too thick, just add a very little amount of hot water, and whisk. On a hot griddle over medium heat, grill the polenta on both sides, and then set it aside, covered. Bring a pot of water to a boil over medium heat to poach the eggs. Add the remaining 2 teaspoons of vinegar, and then carefully crack the eggs one at a time into the water. Cook for about 3 to 3-1/2 minutes, then remove them with a slotted spoon. Assemble the eggs Benedict by placing the polenta on the plate, topping with eggs and then drizzling with Hollandaise sauce. Garnish with chives, if using.